These investors are keeping an eye on the shares of NextEra Energy Partners, First Solar, and Brookfield Renewable Partners. Here's why. Following the renewable energy industry has been fascinating over the past few years -- and likely nauseating for anyone with money in the industry as stock charts in this industry resemble intense roller-coaster rides. One thing that captures the imagination of investors in the renewable energy space is the sheer size of the investment opportunity in the coming years. According to the Bloomberg New Energy Finance report, renewable energy will generate 50% of the world's electricity by 2050, which means trillions of dollars in investment. With this in mind, we asked three Motley Fool contributors to highlight three stocks in the renewable energy industry and why they are on their radar screens this month. Here's why they are keeping a close eye on NextEra Energy Partners (NYSE:NEP), First Solar (NASDAQ:FSLR), and Brookfield Renewable Partners (NYSE:BEP). Matt DiLallo (NextEra Energy Partners): Clean energy company NextEra Energy Partners offers income investors an enticing proposition. The company anticipates that it can increase its 3.7%-yielding dividend at a 12% to 15% annual rate through at least 2023. Add the two together, and the wind and solar power company could generate total annual returns in the 16% to 19% range over that time frame. 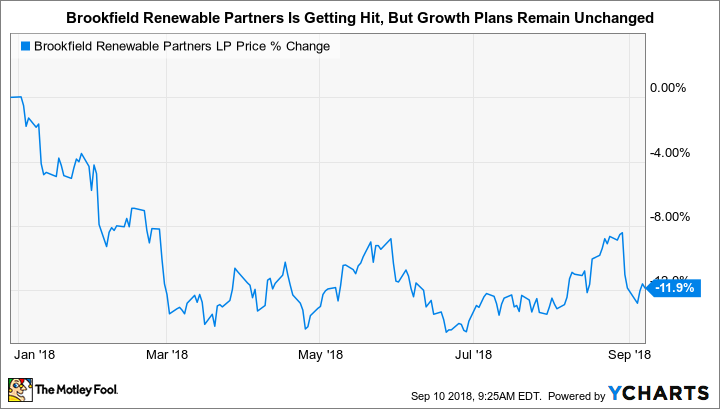 Powering NextEra Energy Partners' forecast is the expectation that the company can continue acquiring cash-flow-producing wind and solar energy facilities from its parent company, which has one of the largest renewable power businesses in the world. However, there's just one catch with that forecast: NextEra Energy Partners needs to maintain its current valuation multiple to generate those returns. At more than 20 times cash flow, that seems unlikely since many rival high-yielding renewable energy companies currently sell for around a low-teens multiple of their cash flow. 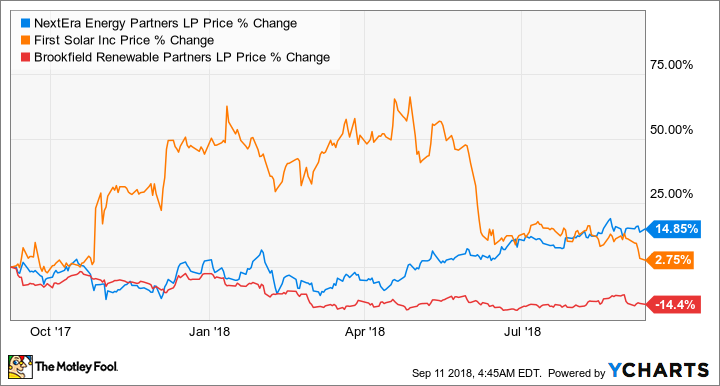 While those peers only expect high-single-digit annual dividend growth -- and therefore should trade at a cheaper valuation -- NextEra Energy Partners' premium price is a bit too rich in my opinion. Though that premium price tag is currently keeping the company off my buy list, I do believe it has a bright future, which is why I think investors should put it on their watchlist until its valuation comes down into the mid-teens. Will First Solar buck industry trends and grow sales? Tyler Crowe (First Solar): Solar panel manufacturer First Solar has been a fascinating stock to follow over the past few years. Investors were enamored with the stock in 2017 as developers lined up to buy panels to get ahead of restrictions on some of the tax credits associated with solar and potential price impacts on tariffs. The company booked an incredible amount of sales then and was able to net some windfall profits from selling utility-scale projects at higher-than-expected prices. It also helped that First Solar maintained a massive pile of cash on its books that gave it the option to invest in expanding capacity. Since, then, though, shares of the company have cooled off considerably as demand for panels has dried up, and China's decision to slow the growth of solar in the country has flooded the market with too many panels and not enough buyers. During the past quarter, First Solar's sales were down more than 45% compared to the prior year and gross margins on panels sold slipped into negative territory. This slowdown led to management reducing guidance for the year. The solar panel manufacturing business has been notoriously cyclical over the years, largely because so much of its sales were tied to tax breaks and other government incentives for investment in renewables. Several of those tax incentives will start to wind down over the next few years -- at least in the U.S., where First Solar sees the bulk of its sales -- but solar is also becoming more cost competitive by the day and is already less expensive than fossil fuels in many cases on an unsubsidized basis. First Solar's management will have to react to some of the technological developments in the industry, but there is still ample opportunity to grow in this business and I'll be watching for any signs that First Solar can position itself to be stronger for when the winds for solar shift in its favor again. Reuben Gregg Brewer (Brookfield Renewable Partners L.P.): Brookfield Renewable's second-quarter earnings highlight an important fact: Around 75% of its revenue is generated by hydroelectric plants. And when rainfall is lower than expected, the renewable power partnership's results will suffer. But hydro assets are highly reliable long-term sources of clean power and hard to replace, giving Brookfield a solid foundation on which to grow. That growth is what's so exciting about Brookfield Renewable, especially given that the shares are down more than 10% so far this year following a swift, post-earnings-release price drop. Short-term thinking is driving the stock price despite the fact that the long-term story hasn't changed at all. Brookfield is using its core hydro business to help support expansion into wind and solar assets, up-and-coming renewable technologies (at least compared to hydro) that are increasingly competitive with older, dirtier energy sources. The yield, meanwhile, is a robust 6.3%. And Brookfield Renewable expects its investments in wind and solar, along with continued acquisitions, to support 5% to 9% annual distribution growth. Based on its history of distribution growth, that's not an unreasonable outlook -- distributions have expanded at a mid-single-digit rate over the trailing one-, three-, and five-year periods. The investment-grade-rated company has a backlog of 8 gigawatts of growth projects it's considering (1.3 gigawatts are in advanced states of development). That will allow it to keep expanding its current 17.4 gigawatts of capacity and provides a lot of support to its distribution growth projections. Brookfield Renewable's recent price drop is an opportunity for income investors to pick up a high-yield renewable power company building off a strong base. Don't wait too long, however, or you may miss the chance here.